This free 4 page Excel business plan financial projections template produces annual income statements, balance sheets and cash flow projections for a five year period for any business. The financial projections template is available for free download below. Download the latest available release of our FREE financial projections template in Excel format by subscribing to our mailing list using the form below. There are four pages to the financial projection template, supplying everything you need to test out your business idea. 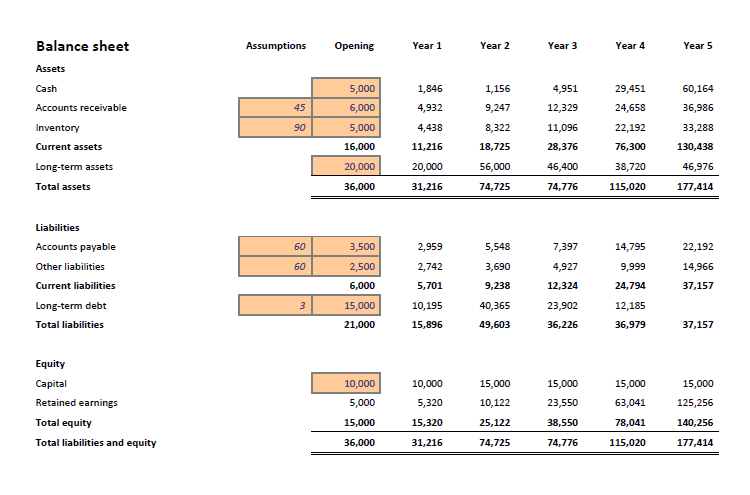 The first page of the financial projections template shows income statements for the business for 5 years. The second page of the financial projections template shows the opening balance sheet and the balance sheets for 5 years. 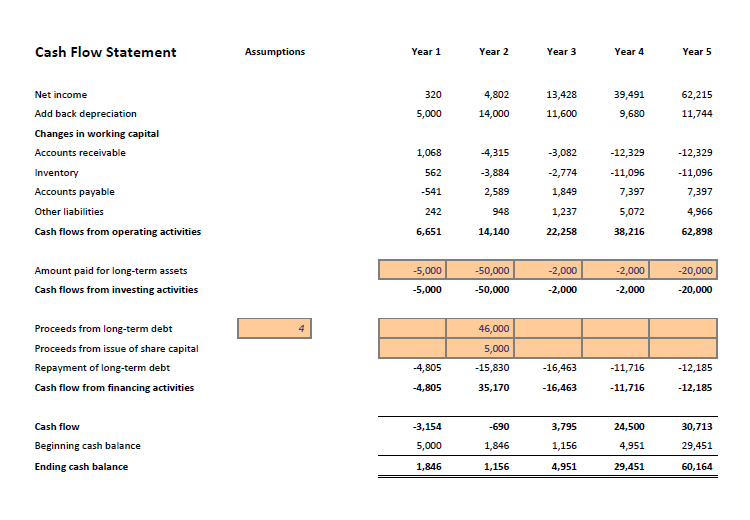 The third page provides the cash flow statements for 5 years. 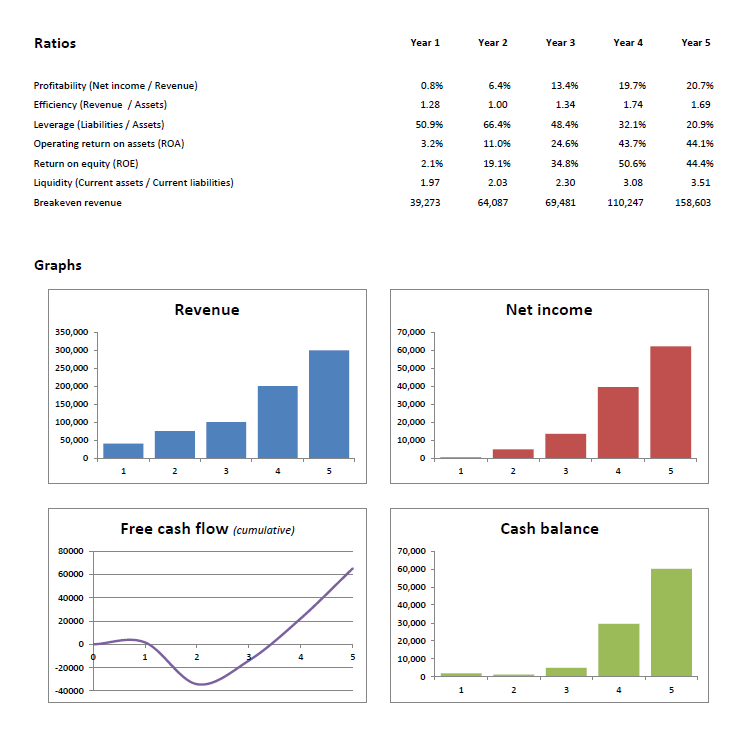 The final page of the financial projections template contains a selection of useful financial ratios for comparison purposes, together with revenue, net income, cash balance, and cumulative free cash flow by year in graph form for easy reference. Extra templates and calculators are available to help you calculate revenue, weighted average gross margin, and activity ratios such as accounts receivable, inventory and accounts payable days, for use in the financial projections template. Select a category from the menu to the right or chose one of the templates or calculators below. Financial projections are critical to the success of your business plan, particularly if the purpose is to raise finance. We have designed our financial projections for startup template to help you test your business idea and create a five year business plan financial projection. Alternatively, you can use our online calculator to provide a quick and easy way to test the feasibility of your business idea. Users use this business plan financial projections template excel at their own risk when deciding how to make financial projections for startups and carry out a startup financial analysis. We make no warranty or representation as to financial projection model template accuracy and we are covered by our Terms and Conditions, which you are deemed to have read. 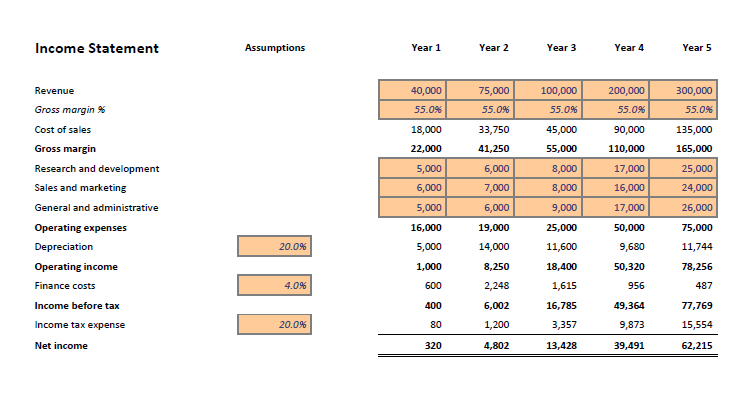 This is an example of a five year financial projection example template format that you might use when considering how to do a startup financial projections template. It is purely illustrative. This is not intended to reflect general standards or targets for any particular company or sector. If you do spot a mistake in the projected financial statement template, please let us know and we will try to fix it.